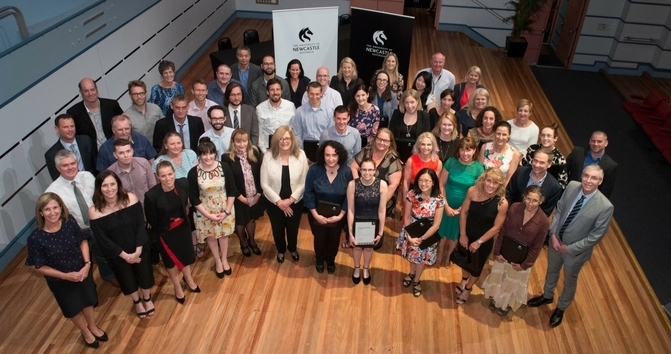 The 2017 Vice-Chancellor’s Awards for Excellence recognised over 60 remarkable academic and professional staff in all Faculties and Divisions for their significant achievements, willingness to go ‘above and beyond’ and take on new challenges, and for their contributions to our NeW Futures strategic goals. Vice-Chancellor, Professor Caroline McMillen, presented individual and team awards across seven categories at the awards ceremony on Monday 4 December 2017 at The Conservatorium in Newcastle. "It is with great pride that I recognise the incredible work of our colleagues through the Vice-Chancellor’s Awards for Excellence. The calibre of nominations this year was truly outstanding and showcased the tremendous talents, creative thinking and dedication of our staff. It was particularly impressive to see the high level of collaboration and innovation celebrated through this year’s awards- through drawing on the varied disciplinary and professional expertise of teams across the University, our nominees have demonstrated new ways to improve the student experience, to work more effectively, and to initiate and deliver on complex, sector-first projects. "I congratulate all award nominees and winners for their exceptional leadership and performance in 2017 and thank them for their significant efforts and commitment to supporting UON’s continued success," Professor McMillen said. Download the 2017 Vice-Chancellor’s Awards program (PDF 954KB) and view the photos from the awards ceremony. Dr Tim Connor has transformed Company Law - a compulsory course covering dense and complex legal material - from one many students found dry and uninteresting into one of the most popular courses in the Faculty. Tim breaks complex topics down into sub-topics and replaces traditional lectures with a variety of on line resources that assist students to master each sub-topic before moving to the text. Tim also designs highly engaging in-class activities, draws on current social issues to highlight the course's relevance and establishes a supportive classroom culture that students value highly. Tim's commitment to challenge and motivate his students has ensured a highly improved learning experience. As the Project Director responsible for the delivery of the New Space project, Damian's exceptional leadership in the design and delivery of the building will be enjoyed for generations to come. Standing as a beacon for a city on the cusp of emergence, Damian has guided the project delivery of New Space over a four year period, embracing challenges and leading collaboration with confidence, bold thinking, respect, and strong direction and leadership in achieving significant strategic priorities. In only 12 months at UON, Elmari has stepped up from the role of Business Support Officer to Insurance Officer and has excelled in this position. Elmari implemented a process to support Researchers recouping over $500,000 in outstanding insurance funds arising from the April 2015 storms. Elmari created improved processes to remove administration which supported Researchers to do what they do well-research. Further to this, in response to the increase in international incidents, and to ensure our travelling staff and students are supported and assisted when impacted by events abroad, Elmari redesigned UON's response times and communications. Both of these major projects have had a tangible financial and safety improvement for UON, its staff and students. Carolyn provides exemplary technical service to human physiology teaching in the School of Biomedical Sciences and Pharmacy, which teaches approximately 450 students per year. Weekly laboratory sessions require meticulous records of equipment use and storage, the spacing around equipment for multiple users and safety, when repairs and calibration are required and an understanding of the equipment interface with computerised data collection. Carolyn has pioneered the use of kuraCloud software whereby laboratory data is migrated to the cloud. Students and staff can then review and manipulate data outside the laboratory which significantly enhances the student experience in these courses. Mechanical Engineering and Mechatronics Workshop Team - Faculty of Engineering and Built Environment: Ian Clarke, James Bradley, Dean Ferry and Phillip Dombkins. Student Communication (Peer to Peer) Team - Academic Division: Susannah Lynch and Jayne McCartney. Gift Governance Project Team - International and Advancement Division, Resources Division, Faculty of Health and Medicine, Vice-Chancellor's Division: Alison Kinder, Kade Hinds, Katrina Cowie, Laura Beever, Shirley Savy, Elaine Abery and Alice Jackson. Jason has positioned himself in the public discourse on disasters, with a focus on systems of injustice that underpin vulnerability both in Australia and internationally. He has published over 70 peer reviewed papers and secured over $3 million in research funding. Jason is gaining traction in writing for non-expert audiences via magazines, online media outlets and blogging, while securing media appearances on the ABC, BBC, AP and various radio shows. His feature documentary, Deviate, is due for release in 2018 and represents his plunge into film as a medium to communicate about his field of expertise. Christine is an exceptional role model for her Higher Degree Research students. She has trained eight PhD students and currently supervises nine PhD students, four postdoctoral fellows, and three health service professionals. She won the University Postgraduate Student's Association (NUPSA) Supervisor of the Year in 2009 and the Faculty of Health and Medicine Award for Supervision Excellence in 2012. Testimonials from her students emphasise her generosity, inclusiveness, capacity to listen, and role as a life-long educator and mentor. Importantly, she continues to support her students' careers after their training by providing advice and input to their fellowship, grant and award applications. Department of Rural Health Allied Health Discipline Mentors Team - Faculty of Health and Medicine: Alexandra Little, Luke Wakely and Rebecca Wolfgang. Ma & Morley Scholarship Program Project Team - International and Advancement Division, Vice-Chancellor's Division and Resources Division: Adrienne Lindsay, Emily Cox, Sheena Martin, Clare Nader, Jamie Daniluck, Peter Eckermann, Lauren Miles, Kieran McGeachie, Rachel James, Joanna Harrison and Jemma Bowman.